Iran Celebrates 40 Years Since Islamic Revolution, Trump and Bolton Call It 40 Years of Failure 5 out of 5 based on 3 ratings. 3 user reviews. On February 11th, Iranians took to the streets in celebration of the 40th Anniversary of the 1979 Islamic Revolution. Crowds gathered as Iranian President Hassan Rouhani gave his address to the nation at Tehran’s Azadi (Freedom) Square. During the festivities, many of the demonstrators chanted “Death to America”, “Death to Israel” and “Death to the al-Saud” family of Saudi Arabia. Iranian State News Agency, IRNA, spent the entire day reporting on various countries that celebrated with Iran. Lebanon, which said it will not partake in the upcoming Warsaw Conference, organized by the US and Poland and aimed against Iran. The Warsaw Summit was called “worthless” by Iran’s Chief of Staff of Armed Forces Major-General Mohammad-Hossein Baqeri. As expected, the Trump administration used the occasion to attack Iran’s government and progress. US President Donald Trump and US National Security Adviser John Bolton both strongly attacked the 40th anniversary, saying they have been nothing else than 40 years of failure. The POTUS posted a banner, with the caption “40 years of corruption. 40 years of repression. 40 years of terror. The regime in Iran has produced only #40YearsofFailure. The long-suffering Iranian people deserve a much brighter future,” which was also translated in Arabic. Congratulations Iran! Stay strong and free! 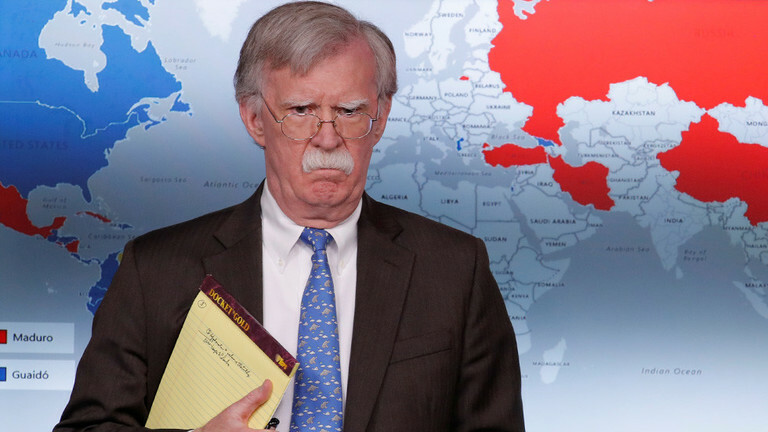 Me and Bolton now predict a US victory parade through Tehran will happen before 2020 run out, and all Iranians will bow and look up to Americans because US gave them freedom. I do not think it was the CIA, it was the The Anglo-Persian Oil Company (APOC) . In 1935 APOC was renamed the Anglo-Iranian Oil Company (AIOC) and in 1954 it was renamed again to the British Petroleum Company (BP) subsequently BP. It’s so depressing to see that so many people, even those who supposedly follow international events closely are still so clueless about Iran that they don’t even know Iran’s language is Persian, not Arabic. They are not clueness, they just thought the posters referred to the USA. it had been more apt if iran had said that of moronistan (aka usa) siince there hardly is a country more corrupt than moronistan, no country where repression is more rampant than in moronistan and no country where terror is more widespread than in moronistan (policeviolence/killings and number of prison inmates highest in the world) and with 50 millions of its population on food stamps and/or living under the poverty line – and that’s no joke but a larf anyway. If going to bemoan ignorance…at least be correct. Iran speaks mostly farsi no? Yes Iran’s official language is Persian/Farsi and is spoken by all Iranians. Arabic is a very small minority language spoken by less than 2% of the population as a second language. Ok.persian and farsi is kinda the same ok thanks for the clarification. Trump’s twitter post…was it in arabic or farsi? Thats the real question…how stupid is washington really?? His post was in Farsi (Persian is just another name for Farsi, it is the exact same language), however the author of the article incorrectly thought the post was in Arabic probably because he’s not aware that Iran’s language is Farsi. The Yankers are so pathetically childish, they drive me mad. “I am wery wery angwi”. well well, bolton is a luna bin incarceration waiting to happen . stark raving mad and foaming at the mouth if and when you say iran, or syria and venezuel. how did it happen that a stark raving mad person got into the position he is occupying .- hitler supposedly foamed and chewed away at the nearest carpet when things didn’t go his way and I suspect that stark raving mad bolton is chewing away on curtains or some such soft stuff, not to damage the dental work.